3:50am: Minivan News ends live coverage. 3:40am: At least nine people have been arrested. The police have now dispersed protesters. The protest remained peaceful throughout. MP Mahloof was arrested on charges of disobedience to order, the police have said. 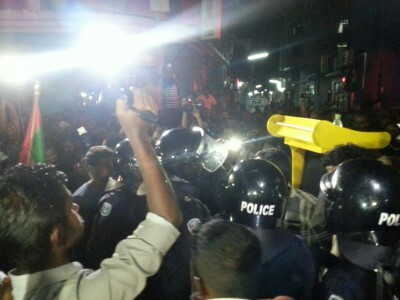 3:20am: Several eyewitnesses have said they saw police arresting MP Ahmed Mahloof. Another young man, Ahmed Naeem, has also been arrested. Minivan News journalists also saw some eight young men, who appear to be pro-government supporters, quarrel with protesters. They left on motorcycles shortly afterwards. 3:10am: Police have chased a man carrying a megaphone into the narrow lane where ex-president Nasheed’s paternal home is located. Police officers in regular blue uniforms are urging protesters to leave the area. Dozens of police officers in one lorry and two jeeps are patrolling the area. Musthafa Luthfy, Shifaz and Mahloof spoke to the crowd previously, and urged supporters to continue to exercise their right to assemble peacefully. Speakers stop speaking the moment police arrive, but resume when police leave. 2:40am: Hundreds remain on the street. MP Ahmed Mahloof is reiterating the opposition’s demands to free jailed politicians, protect businesses and to end fear and intimidation on a megaphone. 2:20am: Some 200 protesters and leadership figures remain on Majeedhee Magu near the Malé City Hall. Dozens of police officers in two lorries and two jeeps are driving back and forth in the area. Musthafa Luthfy, ex-president Nasheed’s running mate in the 2013 presidential polls, says the leadership has not decided to end the protest and will continue as long as supporters are willing to remain on the street. 2:00am: MP Ahmed Mahloof says the protest is not over, and has called on protesters to regroup. The location is unclear at the moment. 1:50am: Minivan News journalists observed police approach the opposition leaders, and said the protest was unlawful and asked them to leave the area. The MPs posed some questions to the police, but showed no real resistance when police escorted them behind barricades. 1:40am: Opposition leaders appear to have ended the sit-in. 1:30am: Opposition leaders have stood up on police request, but were then escorted out of the Malé City’s central junction to a side street. 1:00am: MP Ibu says the leadership is attempting to establish a connection with the protesters, while former environment minister Mohamed Aslam said he will remain on the street until he urinates on himself. SO officers are dispersing the remaining pockets of protesters in side streets. 12:55am: The speaker system on Ma. Maadheli, at the junction of Majeedhee Magu and Chaandhanee Magu has been switched off. The police have searched a security guard at the building. On May Day, the police entered the building and confiscated the speaker system there. 12:45am: A young man, Nazaal Shiyam, has been arrested for taking photos without a media pass. The police have restricted media to the pavements. 12:35am: The sitting opposition leaders include MPs Ali Azim, Eva Abdulla, Ibrahim Mohamed Solih, Imthiyaz Fahmy, Mohamed ‘Bigey’ Rasheed, Abdul Bari Abdulla, Abdul Ghafoor Moosa, and Ali Hussein, and former Environment Minister Mohamed Aslam. 12:25am: Leadership remain huddled together, sitting on the ground at the junction of Majeedhee Magu and Chaandhanee Magu. Police have chased most of the protesters down side streets. Protesters have reported two arrests. 12:15am: Police are using pepper spray to disperse protesters. Opposition leaders are continuing the sit-in. 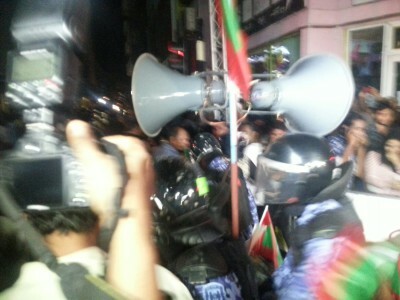 But protesters have been pushed east on Majeedhee Magu by a block. 12:10am: Police clad in riot gear are using shields to push back opposition leaders, who are sitting peacefully on the ground at the front lines. 11:45pm: Opposition leaders are continuing to address the crowd using hidden sound systems on residential buildings in the area. 11:36pm: The police have warned they will break up the sit-in if protesters continue to use sound systems and disrupt traffic. Opposition leaders, however, are continuing to appeal to the crowd to remain on the street. Former MDP MP Ahmed Abdulla has denounced police actions and is continuing a chant for Nasheed, Imran and Nazim’s release. 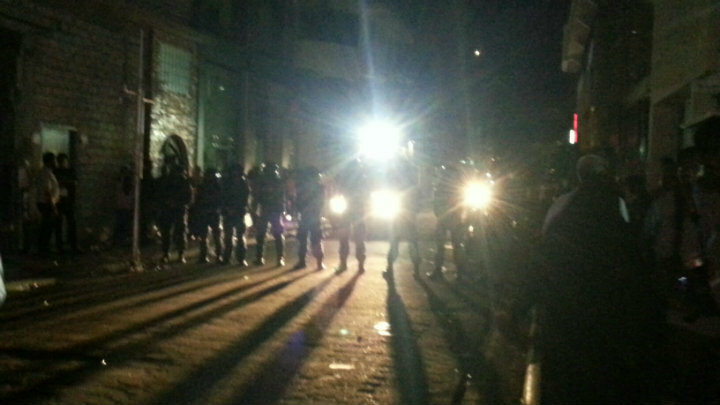 11:23pm: The SO officers used pepper spray against some protesters and took away the three carts with the loudspeakers. 11:20pm: Specialist Operations (SO) walked into the crowd from two directions and have confiscated the sound systems. 11:15pm: Riot police approached the podium twice after 11:00pm and asked the leadership to stop using loudspeakers or sound systems. But the police did not attempt to confiscate the sound system and opposition politicians are continuing their speeches. Less than 2000 people turned out to MDP’s protest tonight. A clear indication that people prefer peace and stability. 10:50pm: Opposition leaders are addressing some 2,000 supporters. In their speeches, MP Ahmed Mahloof, MDP MP Abdulla Shahid and former minister of Islamic affairs Dr Abdul Majeed Abdul Bari, appealed to supporters to remain steadfast and called on the government to c.
Traffic is flowing in side-streets. JP leader Qasim Ibrahim, in several tweets, distanced himself from the MDP protest, and appealed to his employees to stay away from the sit in. mdp in Mihaaru e gendhaa muzaaharaa gai baiverivumakah Qasim Buni Kamah e hadhanee Bodu dhogeh . Mdp in Mihaaru Kuriyah gendhaa muzaaharaa gai jp in baiveri eh nuvey adhi nuves vaane . Villa ge ehves muahzifakuves mdp in Miadhu Kuraa muzaaharaa gai baiveri nuvun edhen mee qasim ge aadheeys . 10:38pm: Jumhooree Party MP Ali Hussain is speaking now. Adhaalath Party council member Shidhartha Shareef addressed the crowd after Shifaz’s speech. She repeated the demands for an end to the government’s “tyranny” and urged the public to join the sit-in. Volunteers are distributing juice and water among the crowd. 10:14pm: Ibu has called on the government to release imprisoned opposition politicians, drop terrorism charges against Adhaalath Party leader Sheikh Imran and JP deputy leader Ameen Ibrahim, stop targeting opposition-aligned businesses, and ensure job security for opposition supporters. The opposition protests will continue serially until the demands are met, Ibu announced to cheers from the crowd. MDP vice president Mohamed Shifaz is now speaking. 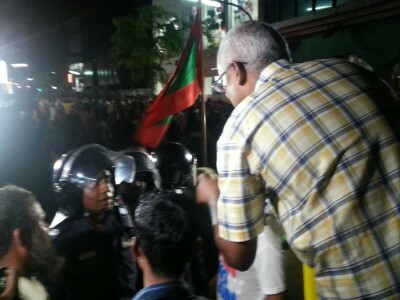 10:10pm: Ibu’s speech was briefly interrupted after riot police officers approached the MDP parliamentary group leader. The police officers have since left and Ibu has resumed his speech. A “dark autocratic cloud” is growing over the Maldives and “rule by law” prevails instead of rule of law, he said. 10:03pm: A podium has been set up at the Chandhanee Magu-Majeedhee Magu junction and protesters have sat down following announcements. 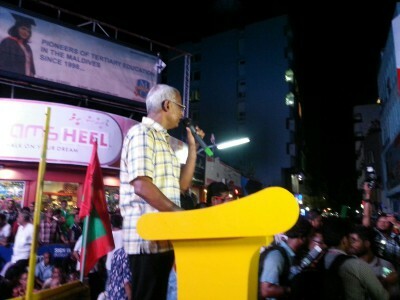 MDP MP Ibrahim Mohamed Solih ‘Ibu’ is addressing the crowd. 9:55pm: The protest march has turned into Chandhanee Magu and the front line has stopped near the Asrafee bookshop. There are no police barricades blocking the path, but some police officers are on the road and appear to be diverting traffic. 9:42pm: The front line has moved past the former city council office and the tail end is near the national stadium. More people are joining the march. The crowd is festive and chanting for the release of “political prisoners.” National songs are blaring from the sound systems. 9:33pm: The protest march has reached the national stadium with the tail end near the prosecutor general’s office. Protesters are calling for the release of former President Mohamed Nasheed and ex-defence minister Mohamed Nazim. Minivan News estimates the size of the crowd is approximately 1,500. The protesters are divided into groups with a cart carrying a sound system and water for each group. Each group is led by a designated leader. A police van is moving ahead of the front line and had stopped at the Sosun Magu-Majeedhee Magu junction, halting the march for about 20 minutes. The police van is now moving forward slowly. 9:15pm: Protesters have started marching west on Majeedhee Magu, streaming out of the artificial beach. 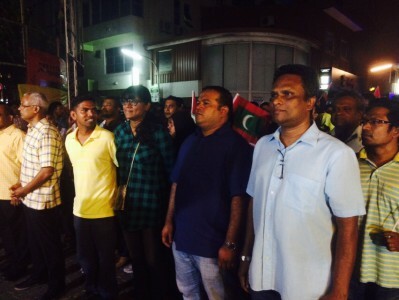 MDP leaders are at the front line with former MP Ali Azim bearing a national flag. Many protester are carrying national flags. The atmosphere is calm. Before heading out, former MDP vice presidential candidate Dr Musthafa Luthfy said protesters will march in rows of seven or ten and sit down in a location at Majeedhee Magu. If the police crack down and disperse the crowd, he urged protesters to regroup on the main road. Some 500 people have now gathered at the Artificial Beach area. 8:45pm: The youth wing of the opposition coalition, Heylaa, is collecting donations to pay over US$7000 in fines levied by the Elections Commission. The commission said the MDP and Adhaalath Party had violated political party laws during the May Day protest, after violent clashes broke out between protesters and police at dusk. 8:35pm: Foreign Minister Dunya Maumoon, in a tweet, said she hoped the opposition will be responsible. The sit-in is taking place in a more conciliatory political environment than May 1. 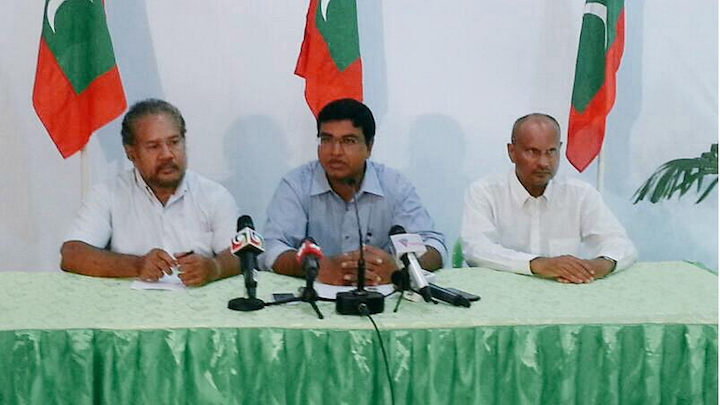 The allied opposition parties have welcomed President Yameen’s call for talks. The Jumhooree Party, the first to meet with government representatives last week, asked the government to facilitate joint talks between all parties. They have also requested the government to free opposition politicians in jail or facing criminal prosecution, ensure judicial independence and protect investors. 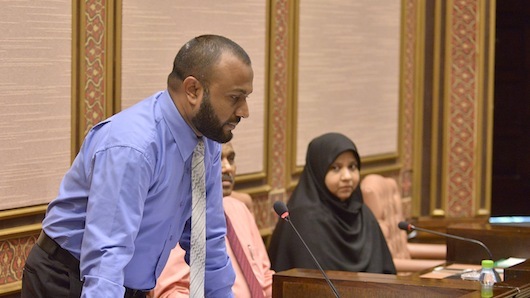 Opposition MPs have also ended a three-month long protest in the People’s Majlis. 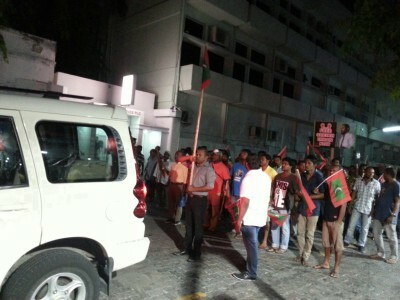 8:30pm: Some 250 people have now gathered at the opposition haruge at the Artificial Beach. The atmosphere is festive. National songs are blaring on speakers. The makeshift masks for tear gas and pepper spray seen at the May Day protest are absent. Most supporters are in casual wear. 8:15pm: Dozens have started gathering at the Artificial Beach area for the opposition’s third mass anti-government protest this year. Organizers say they plan to hold a prolonged sit-in at Malé’s thoroughfare Majeedhee Magu. The police have asked the main organizer, the Maldivian Democratic Party (MDP), to end the sit-in by midnight, and have banned the use of speaker systems beyond 11pm. Hugo Swire, the UK minister of state for foreign and commonwealth office, in a tweet urged restraint, and said he has spoken to Foreign Minister Dunya Maumoon on the issue. Raised today’s rally in Malé with the #Maldives Foreign Minister. Both agree restraint on all sides essential for peaceful protests. The Maldivians Against Tyranny coalition is protesting over the imprisonment of ex-president Mohamed Nasheed and ex-defence minister Mohamed Nazim in trials widely criticized for lack of due process. A third concern is the government’s sanctions on businesses belonging to Jumhooree Party leader and tourism tycoon Gasim Ibrahim. The tax authority has frozen some of his Villa Group accounts over a controversial US$90.4million fine. Nasheed’s wife, Laila Ali, will join tonight’s sit-in. President Abdulla Yameen is in China and is set to return on June 16. The MDP has said the rally will be peaceful and notified the police that the protest may last for three days. “The police, under no circumstances, have said protesting is banned. Police will not say that you cannot protest for three, four or five days. But we will take the necessary steps to ensure safety from any issues that arise,” he told the press at a press conference this evening. He pledged police cooperation if the protest remains peaceful. The opposition has asked supporters to prepare for a prolonged sit-in on Malé’s thoroughfare Majeedhee Magu tomorrow (June 12), and have notified the police that the protest may last for three days. “We will continue to protest as long as we can peacefully continue,” said Ibrahim ‘Ibu’ Mohamed Solih, MP of the main opposition Maldivian Democratic Party (MDP). The Maldivians Against Tyranny coalition – which consists of the MDP, the Adhaalath Party, members of the Jumhooree Party (JP) and family members of jailed politicians – is protesting over the imprisonment of ex-president Mohamed Nasheed and ex-defence minister Mohamed Nazim, and the targeting of opposition businesses. Supporters have been told to wear comfortable clothes and gather at the opposition’s campaign office near at the Artificial Beach area at 8:30pm. Organizers stressed that the sit-in will be peaceful, but declined to reveal further details of plans for the protest. The sit-in is the third mass protest called by the opposition. Some 10,000 protesters marched on February 27, while some 20,000 protested on May Day. President Abdulla Yameen is in China, and due back on June 16. MDP has set a hash tag for the sit-in, #BaaraHayeh15, reflecting the date of the protest. Supporters are also using #OccupyMajeedheeMagu and have set up a blog with news of the event. Mohamed Shifaz, the MDP vice-president, said some 5,000 supporters from the Maldives’ remote atolls will converge on Malé for the protest. Some 2,000 have already arrived, he said. “The largest groups are coming from the southern Addu atolls, central Laamu and Alif Atolls and northern Noonu and Haa Alif atolls,” Shifaz said. He also assured supporters that the leadership will remain with protesters throughout the protest. Key opposition figures are in prison or abroad. The JP’s deputy leader Ameen Ibrahim and council member Sobah Rasheed left the Maldives shortly before the Prosecutor General’s office pressed terrorism charges on a claim of inciting violence at the May Day protest. Sobah has since said he is seeking political asylum abroad. Adhaalath President Sheikh Imran Abdulla is in police custody, awaiting the conclusion of a terrorism trial, also on charges of inciting violence. The MDP chairperson Ali Waheed, who was arrested on May 1 along with Imran and Ameen, is abroad in an unspecified country for medical treatment. MP Ibu has denounced what he called the government’s attempts to disrupt the protest. The biannual street market in Malé was due to end on June 8, but extended until June 13. The organizers said the extension was necessary due to heavy rain last week. Ibu also said the government had pushed back a sermon by Islamic Scholar Mufti Menk from June 11 to the night of June 12. The coalition had chosen June 12 because the government had initially set the sermon for Thursday, he said. The Elections Commission has meanwhile fined the MDP and the Adhaalath Party for “unlawful acts” during the May Day demonstration. The MDP is fined with MVR 53,000 (US$ 3,437) and the Adhaalath Party was handed a fine of MVR 69,000 (US$4,475). The demonstration is taking place in a more conciliatory political environment than May 1. President Abdulla Yameen called for separate talks with the allied opposition parties. He has, however, ruled out negotiations on Nasheed and Nazim’s release. A police spokesperson said officers will cooperate with the protesters if the sit-in remains peaceful. While the opposition has criticized the police for requiring a notice before the protest, the police official said the notice did not amount to seeking permission, but only to allow police to make arrangements for public safety. The police, however, have also announced that the military has guaranteed support for the June 12 protest. JP representatives met with cabinet ministers yesterday, and asked the government to facilitate joint talks between all parties, freeing opposition politicians in jail or facing criminal prosecution, ensuring judicial independence and protecting investors. JP leader and tourism tycoon Gasim Ibrahim has been in Bangkok since late April. According to local media, the criminal court has issued an arrest warrant for Gasim on charges of financing the May Day protest. Nearly 200 people were arrested on May Day. Opposition MPs, meanwhile, are no longer protesting in the People’s Majlis. The opposition will stage a mass peaceful sit-in on the capital Malé’s thoroughfare Majeedhee Magu on June 12. 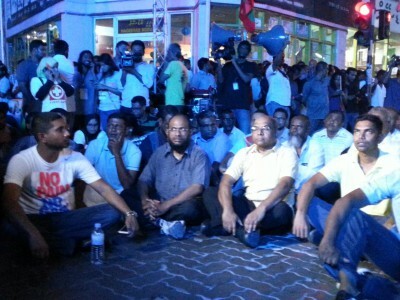 The sit-in signals a change in tactics by the Maldivians Against Tyranny coalition. The opposition’s first mass demonstration on February 27 ended abruptly at 6pm, while the second mass demonstration ended in a police crackdown when protesters attempted to take the restricted Republic Square on May 1. 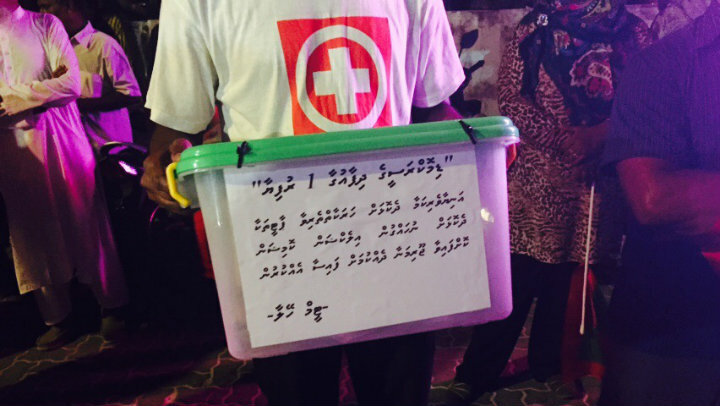 Supporters are to gather at 8:30pm at the opposition’s campaign offices or Haruge at the Artificial Beach. The opposition is protesting over the jailing of ex-president Mohamed Nasheed and ex-defence minister Mohamed Nazim in rushed trials criticised for apparent lack of due process. The tax authority’s decision to freeze Jumhooree Party leader Gasim Ibrahim’s businesses over a US$90.4 million claim is another key concern. The MP’s Villa Group claims the fine is unlawful and is contesting it at the civil court. “We will gather at the Haruge, walk to Majeedhee Magu and stage a peaceful sit-in. We will raise our voices. Depending on the results, we will, if we have to, take to the streets again,” Ibu said. The coalition consists of MDP, the religious conservative Adhaalath Party, members of the JP and defectors from the ruling Progressive Party of the Maldives. JP members were absent at today’s press conference. Two JP officials who played a lead role in the coalition, deputy leader Ameen Ibrahim and council member Sobah Rasheed, left the country shortly before terrorism charges were pressed over the May Day protest. Adhaalath Party president Sheikh Imran Abdulla, also charged with terrorism, is in police custody until the trial ends. Nearly 200 people were arrested at the May Day protest, the largest number of arrests from a single protest in a decade. An additional 15 were arrested on charges of assaulting a police officer. The police have since obstructed the coalition’s attempts at street protests by limiting protests to the pavements, banning the use of speakers beyond 11pm, and requiring permission for the use of four-wheeled vehicles in protests. The allied opposition parties have called for a third mass demonstration for June 12 as President Abdulla Yameen reiterated appeals for negotiations over continuing political turmoil. The call for a new protest comes weeks after police arrested nearly 200 people, including opposition leaders, from a historic anti-government protest on May 1. 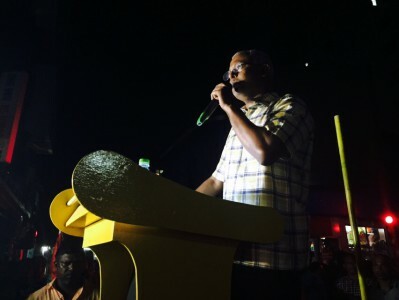 The “large-scale peaceful rally” will be lawful, the main opposition Maldivian Democratic Party (MDP) MP Ibrahim ‘Ibu’ Mohamed Solih said today. He appealed for support from the security forces. “We call upon all institutions, especially the security forces, to cooperate with us for the rally, and not to obstruct the citizen’s from fulfilling their constitutional responsibility,” he said. The ‘Maldivians against tyranny’ alliance is protesting against alleged government authoritarianism and demanding the release of jailed ex-president Mohamed Nasheed and ex-defence minister Mohamed Nazim. 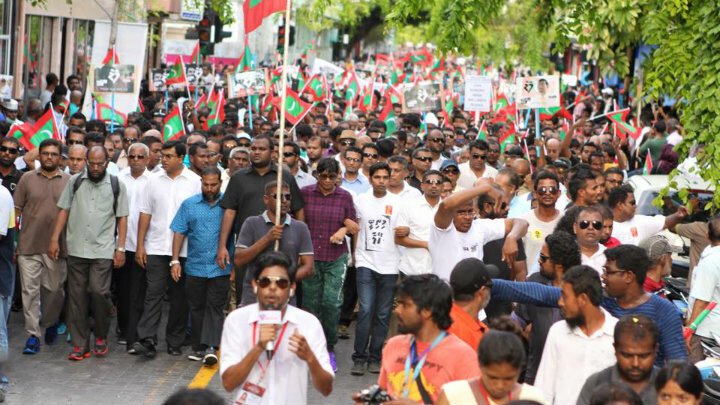 Nearly 20,000 people took to the streets on May 1 in what is thought to be the largest anti-government protest in Maldivian history. The coalition’s activities had slowed down following the May Day crackdown. Police had declared the protest unlawful, arrested the leaders of the three allied parties and used tear gas, stun grenades, pepper spray and baton charges to disperse protesters. Adhaalath Party president Sheikh Imran Abdulla and MDP chairperson Ali Waheed remain in police custody. Jumhooree Party deputy leader Ameen Ibrahim was released by an appellate court. 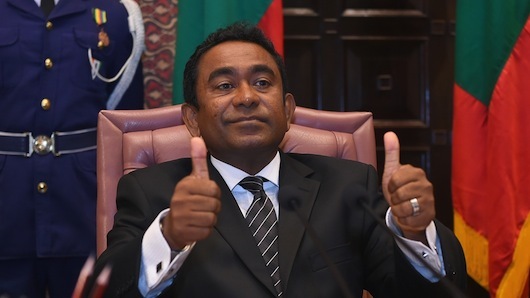 President Abdulla Yameen has meanwhile called for negotiations, but has ruled out discussions over Nasheed and Nazim’s imprisonment, saying he has no authority over their release. The opposition has questioned the president’s “sincerity,” but JP has accepted the invitation, while the Adhaalath says it will sit down with the government once Sheikh Imran is released. The MDP is yet to make a statement on the invitation. “There is no room to question our sincerity. We will find out whether the government is sincere or if the opposition is sincere when we reach the negotiating table,” president Yameen said at a press conference today. He urged Nasheed to appeal, saying the president can only help when the appeal process is completed. Nasheed’s lawyers said the criminal court prevented them from lodging an appeal by refusing to hand over the required court transcripts within the shortened ten-day time frame. The government insists Nasheed can still appeal, but his lawyers say the law, amended by the Supreme Court, is silent on late appeals. “If the opposition claims to protects the people’s rights, then come negotiate with us. The government is ready to accept the issues raised by the opposition with cooperation, so come to negotiate,” he said. Journalists were barred from carrying phones during the press conference, but recorders and cameras were allowed. Responding to the president’s comments, Ibu today said the MDP will answer the government in writing on Thursday. The MDP is holding a national council meeting tonight. “Even at the beginning of our activities we have called upon the government for dialogue, to find solutions through discussions. We see this as President Yameen’s answer to our calls,” he said. The MDP will take the lead in organising the June 12 demonstration, Ibu said. The JP had led the protest on Februray 27 and Adhaalath Party had claimed responsibility for the May 1 rally. The coalition says it will visit various islands in the coming weeks to canvass for support. Nearly 7000 islanders joined the protest in Malé on May Day. The Maldives has been gripped by political turmoil over the imprisonment of ex-president Mohamed Nasheed and former defence minister Mohamed Nazim. The president has previously described the allied opposition parties’ demands for the pair’s release as unlawful, saying they must appeal their sentences at the high court. President Yameen stresses he has no role in Nasheed and Nazim’s incarceration, insisting charges were raised by the independent prosecutor general’s office and tried in independent courts. President Yameen’s earlier refusal to substantially engage with the opposition had resulted in a 20,000-strong march in Malé on May 1. Nearly 200 people were arrested and hundreds were injured in clashes. The leaders of the Maldivian Democratic Party, the Adhaalath Party and the Jumhooree Party were arrested shortly afterwards, and remanded for 15 days. He once again said the pair must appeal their sentences, and said the president was merely repeating an earlier appeal for talks. The opposition has previously accused the government of insincerity in overtures for talks, especially after President Yameen appointed tourism minister Ahmed Adeeb as his representative. The opposition had accused Adeeb of corruption and illicit connections with gangs and had insisted President Yameen himself must sit down with them. Nasheed was sentenced to 13 years in jail on terrorism and Nazim was sentenced to 11 years on weapons smuggling charges. The trials have been condemned by foreign governments and international bodies including the UN for apparent lack of due process. Nazim has filed an appeal, but Nasheed was unable to as the criminal court failed to provide required documents within the ten day appeal period, shortened by the Supreme Court a month before his arrest. The government, however, maintains Nasheed can still appeal, but his lawyers say the Supreme Court’s new regulations are silent on late appeals. The apex court had struck down an earlier provision giving judges the discretion to accept late appeals in the same ruling that shortened the 90-day appeal period to ten days. Nasheed’s family has now asked the UN working group on arbitrary detention to rule his imprisonment as illegal and arbitrary. The allied opposition parties are also calling on the government “to stop targeting” Jumhooree Party leader Gasim Ibrahim’s businesses. The tourism ministry in February slapped a US$90.4 million fine on Gasim’s Villa group, which the company insists is unlawful. The central bank yesterday froze the bank accounts of several of Villa group’s subsidiary companies. On a rainy Sunday night, dozens of families gathered in Malé to meet with lawyers over the detention of their loved ones, arrested from a mass anti-government protest on May 1. The vast majority of the 193 detainees had never been arrested before. Some families had travelled rough seas and weathered strong winds to come to Malé to find out the news. Lawyers passed on messages from those in custody—where keys had been left, progress on monthly rent, extent of injuries—and advised families on how they could seek redress for police brutality. The May 1 arrests were the largest numbers detained from a single protest in a decade. Some 20,000 protesters took to the streets on May Day against authoritarianism, and called for the release of jailed ex-president Mohamed Nasheed. When protesters attempted to enter Malé’s main square at dusk, the police cracked down with tear gas, pepper spray, baton charges, stun grenades and indiscriminate arrests. 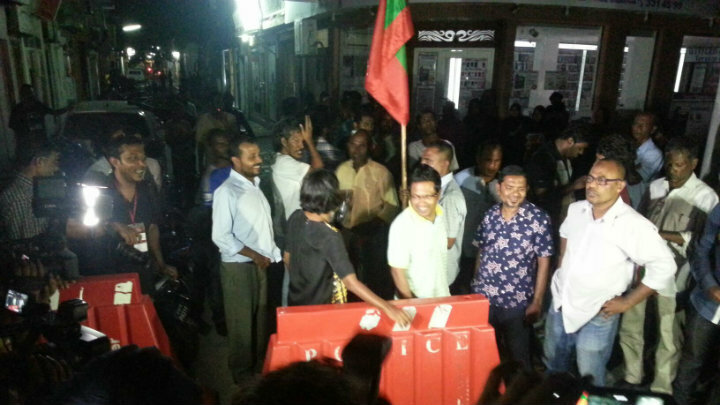 Malé’s streets were empty by 1:00am, and three leaders of the allied parties were arrested. The government declared ‘victory’ with a fireworks display and said that President Abdulla Yameen will not negotiate over Nasheed’s imprisonment. With opposition leaders and scores of supporters still in jail, the opposition coalition’s activities have slowed. Police have prohibited gatherings beyond 12:00am, and dispersed any attempts at street protests by arresting key figures. Malé City is calm for now, but anger is simmering. Opposition supporters remain determined to continue protests, with many saying the police brutality they witnessed on May Day only strengthened their resolve. Growing international pressure over Nasheed’s imprisonment and scrutiny of the judiciary is giving many further hopes. According to Muju, two ruling party supporters were also arrested; one was on his way to open a shop while the other was on his way to a safari boat where he works. Conditions at Dhoonidhoo island detention centre are cramped, with 40 people packed into cells designed to hold just 20. Some are sleeping upright, or sleeping by the entrance to the bathrooms. Many are still nursing injuries from beatings and pepper spray. Several people who were recently released said detainees are calling for the resignation of president Yameen, police chief Hussein Waheed and tourism minister Ahmed Adeeb from their cells. Some 116 people have now been released, and the police have asked the prosecutor general to press charges against 129. If prosecuted, many face a MVR3,000 fine or a six-month jail term. Charges range from disobedience to order to assaulting police officers. 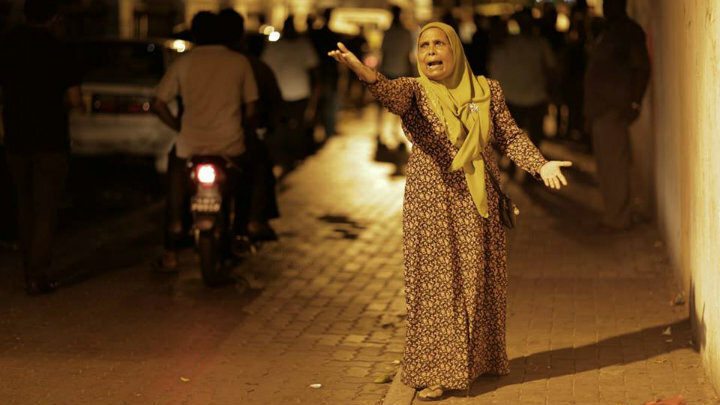 Zahiya Abdulla, 47, and two of her sisters were also arrested from the protest. In the women’s cell, those arrested from the protest held yoga classes, and bonded with others held on charges of drug abuse and sexual offences. “No one was crying despite the physical and verbal abuse they suffered. I will always be on the front lines of the protests,” she said. 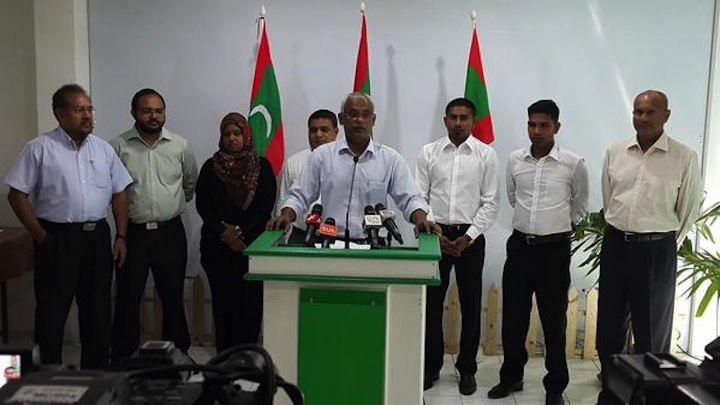 The opposition has vowed to continue protests, with Maldivian Democratic Party (MDP) MP Ibrahim ‘Ibu’ Mohamed Solih pledging to hold “an even bigger rally” by the end of the month. “We have re-formed our ranks, and we’ve are out to go forward once again. Our resolve remains strong,” he told a thousand supporters at a rally this weekend. Some were scared, but angry. A 62-year-old boat owner said he will march and protest as long as the police do not crack down.“But I do believe we will prevail. Our prayers are as powerful as any sword,” he said. A 46-year-old, who had played a key role in organising the pro-democracy “August 12/13 protests” of 2004, told Minivan News he, too, was amazed by the numbers on May Day. He believes approximately 8,000 people had participated in the August12/13 protests a decade ago. “Now, we are seeing thousands more, women, young people, elderly, who’ve never participated in political rallies before,” he said. The August 12/13 protests had forced then-President Maumoon Abdul Gayoom to bring in liberal reforms, a democratic constitution and hold multi-party elections in 2008. The international spotlight is once again on Maldives. Calls for Nasheed’s release are growing, with several countries, including the US, UK and India slamming the Maldives’ politicised judiciary at a recent human rights council session. The EU parliament last month urged member states to warn tourists over Maldives’ human rights record, and Nasheed’s family has asked the UN’s working group on arbitrary detention to rule his imprisonment as illegal. But the government maintains the international community cannot dictate what the Maldives must do, and the home minister Umar Naseer has vowed to keep Nasheed in jail. Back at the meeting between lawyers and families of detainees, one woman said she will now join the opposition protests because of her resort worker husband’s arrest on May Day. She had gone by the criminal court to see if she could catch a glimpse of him at his remand hearing the next day, but instead, she was verbally abused, pepper sprayed and pushed back by police in riot gear. She said she saw police officers pepper-spraying a pregnant woman. “I’ve never seen such brutality before. It is almost as if the police view us as their enemies. But we are the real power here,” she said. The minister of Islamic affairs Dr Mohamed Shaheem Ali Saeed has resigned from the cabinet today. The Adhaalath Party member announced his resignation in a tweet. “I have resigned from the Islamic minister’s post,” he said. Shaheem’s resignation comes after the police arrested Adhaalath Party president Sheikh Imran Abdulla during a mass anti-government protest on Friday. The religious conservative party had split from the ruling coalition in March after the arrest and trial of ex-defence minister Mohamed Nazim on weapons smuggling charges. Dr Shaheem said that it was an immense pleasure to be part of President Abdulla Yameen’s cabinet, and thanked the government for its support. His resignation comes within two days of opposition-aligned religious conservative Adhaalath Party calling upon all party members in high-level government positions to resign immediately. President’s office spokesperson Ibrahim Muaz Ali confirmed the resignation via twitter, but declined to comment further. Several members of the Adhaalath Party had resigned from the government in March and joined the main opposition Maldivian Democratic Party (MDP) in a campaign against government authoritarianism. But it is not clear if Shaheem will join the campaign. He was unavailable for comment at the time of going to press. The Adhaalath Party has congratulated Shaheem for the “courageous” decision to resign from the cabinet, describing it as one that would benefit the country. Speaking to Minivan News, former deputy gender minister Sidhatha Shareef said Shaheem’s resignation demonstrated his loyalty to the party. Adhaalath Party secretary general Iyaadh Hameed on Sunday called on all party members to resign following Imran’s arrest. The sheikh has been remanded for 15 days. The opposition is continuing its protests despite a crackdown and the arrest of nearly 200 people from the May Day protest.